Decorating kid’s bedroom is fun and exciting but takes a lot of thinking, imagination and creativity at hand. It is not as easy as it seems. After all, it is for our little prince and princess. We have to consider their favorites, likes, personality, styles and choices which keeps on changing from time to time as they grow from toddlers to teens. Girl’s bedroom décor differs from boys. If it’s blue for boys, then it’s pink for girls, action hero for boys then its princess and Barbie’s for young girlies. 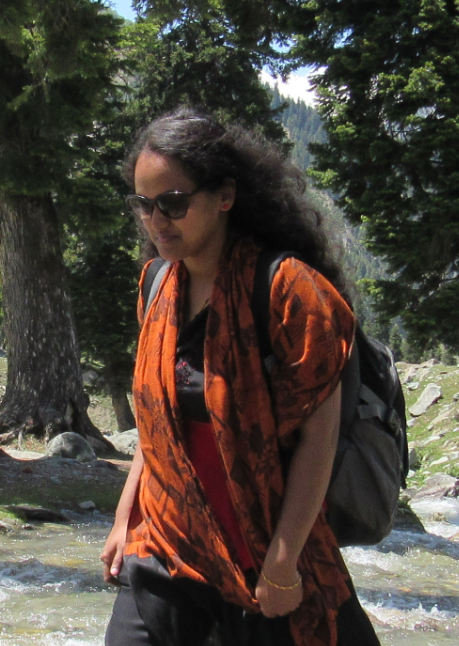 Frills, butterflies, flowers are all about girls. Her room is her castle, so here are few amazing décor themes for your little princess to get inspired from. Girls looooves pink. It requires no explanation or words to show the importance of the color pink in a girl’s life. Girls are always attracted by the color pink and its shades. Setting up a pink themed bedroom for your little precious will enlighten their face and also would make their friends envy. Floral themes are so girly girly. They like to have colorful flowery themes all around them. Making floral themed bedroom décor is pretty easy and also fun for your little ones to jump around. Wallpapers of gardens, mountains, forests or spring setup would add a funky eye catching effect to the whole room. Mesmerizing!! Isn’t it? When we say mermaids, we think of Ariel and the undersea world. Set the bedroom theme according to it by bringing in an exotic touch including themed wallpaper, bedspreads or pillows, stickers, murals and carpets. Make the room super creative and interesting for your gorgeous little girl. Let her dive deep into the whimsical underwater world of her own. Of course, our dear daughters are our little princess and princess does deserve a castle of her own to rule her world. Pink and white or pink and purple combination are perfect here to get the amazing princess theme. These décors give an ecstatic touch to the bedroom making your princess feel as if they are the beautiful princess in their castle. Barbie’s are little girl’s best friend. It’s a craze among young girls. Toys, bag tags, tees, shoes and many more are decked up with Barbie only. They not only love to dress up or be like Barbie but also they like to live in the Barbie world. Uplift your little precious’s bedroom into a fashionable and playful retreat with these simple Barbie design ideas. 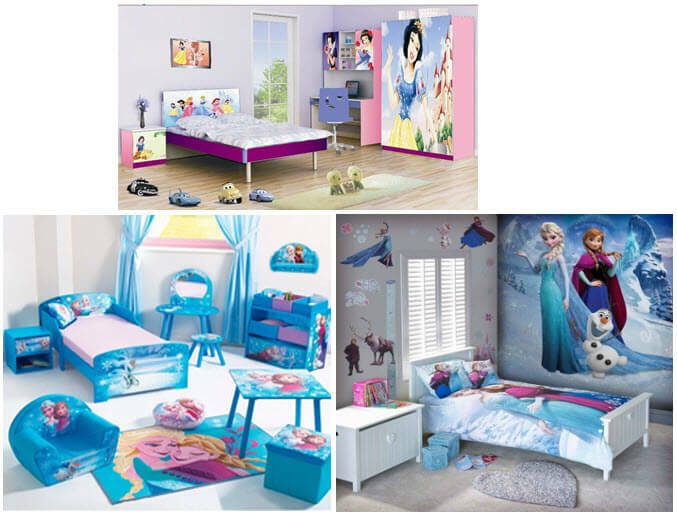 Barbie themed beds, shelves and dressers are easily available in the market as it’s the most desired items. Minnie Mouse and Hello Kitty are a fad among young girls. The vibrancy and simple ambience is sure to bring the twinkle in the little princess’s eyes. Indulge in these themed décor to make your girls captivated in their cuteness. Both these themes create a distinctive element in a fun and cute way. Disney is a craze among many little kids. Girls love many characters like Frozen’s Elsa, Cindrella, Minnie Mouse, Snow white and many more. Gift your daughter a Disneyland in her room and brighten her face. Such décor gives a theatrical effect and a whimsical appearance to the bedroom. Purple is the new pink among girls. Such color themed décor will be intact even if she crosses her teen stage. Such bedroom will give her company for years to come. This colored scheme looks boldly awesome and also fashions a terrifically chic and incredible ambiance in your dearest daughter’s bedroom. Decorating your pretty princess bedroom are fun and exhilarating. Indulge matching murals, rugs, curtains, bedspreads, mirror frames, shelves, wallpapers, wall art and stickers and more to prompt their innocence in a cute way. 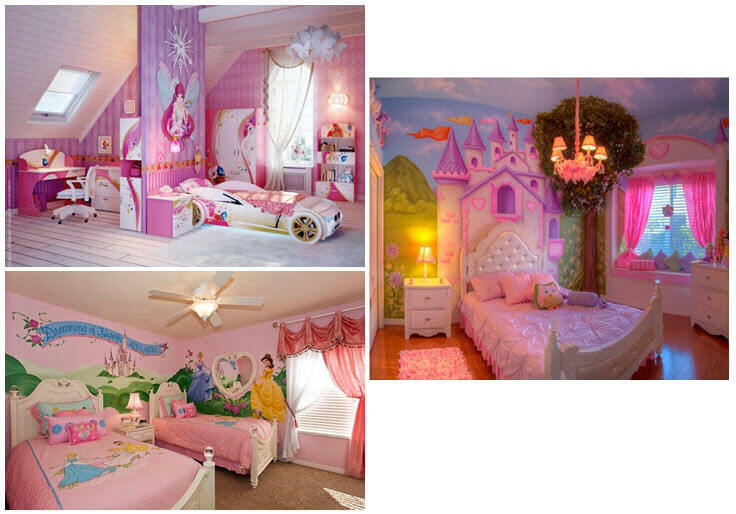 Decorate room in such a way that it turns into a dream room to have fun and comfort for your young girl. Have fun decorating. Enter for your chance to win Disney on Ice Tickets!